In general, Friday was a relatively relaxed day - I had to make a couple trips from the office to home since I have accrued an awful lot of stuff. Like my giant tote of plastic toy food. (Yes, I was teaching at a university, why do you ask?) I packed everything up, took my nametag off my door, turned in my keys, and walked out of the building feeling just like the last time you leave somewhere ought to feel. Resolution. Contentment. Satisfaction. A little worry, but not about leaving. More about where I'm heading. "Change moves in spirals, not circles. For example, the sun goes up and then it goes down. But everytime that happens, what do you get? You get a new day. You get a new one. When you breathe, you inhale and you exhale, but every single time that you do that you're a little bit different then the one before. We're always changing. And it's important to know that there are some changes you can't control and that there are others you can." Not having my contract renewed wasn't ideal, but it wasn't within my control. My boss got just as emotional as I did when she told me they'd be filling the position with new graduate students - I'm a great teacher, she said, and so much of our student retention rate is thanks to my passion, dedication, and the comfortable atmosphere I create in my classroom. She said she'd fully support and endorse whatever ventures are next for me, and so I'm trying to remain hopeful. I can't help but think that there's a purpose for it; the sun has gone down, but it will come back up. It always does. Today is a new day! Knowing that Friday was going to be a tough day emotionally, I made sure I was prepared by having a chocolate brownie Balance bar on hand - it was enough like a treat to prevent the urge to go crazy and use food to forget that I'm *gulp* unemployed. A king-size Snickers bar has almost 550 calories - the Balance bar has 200 calories, plus vitamins and protein. I'm very pleased with my decision - a year ago, I was feeding my stresses with enought takeout to feed a whole family. One of my big challenges right now would have arisen whether my contract was renewed or not: my lunches for the past nine months have almost entirely consisted of Lean Cuisine frozen meals cooked in the office microwave, and I don't have a microwave at home. I don't want to get one, because I'm nervous about having that kind of convenience ... and because I honestly like preparing my meals from scratch. I just need to think of some lunch foods, and quick. Things to keep on hand, things that prepare quickly and are generally 250-350 calories. I've requested the Hungry Girl 200-under-200 and 300-under-300 cookbooks from the library - I've made a recipe of hers before and loved it, so I'm hoping to get some good new ideas. 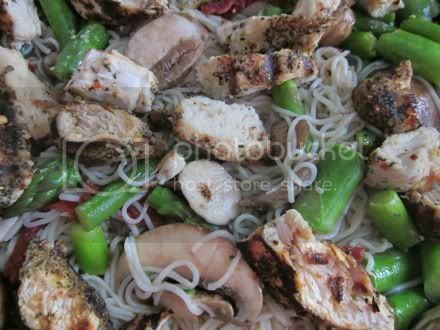 For today's recipe, I made one from her website: Vampire-Proof Chicken 'n' Veggie Pasta, a healthier version of a dish from the Cheesecake Factory. Oh my goodness. Go make this, now. It was so incredibly good, and currently holds the title of My Favorite New Recipe. Use a strainer to rinse and drain noodles well. Pat dry. Cut noodles up a bit, using kitchen shears if you've got 'em. Set aside. Bring a skillet sprayed with nonstick spray to medium-high heat on the stove. Add chicken and season with Italian seasoning, 1/8 tsp. salt, and pepper. Cook for about 4 minutes per side, until fully cooked. Remove chicken from the skillet. Once cool enough to handle, slice chicken and set aside. Remove skillet from heat, re-spray, and return to medium-high heat. Add asparagus and 2 tbsp. water. Cover and cook for 4 minutes. Remove cover and add mushrooms, tomatoes, and garlic to the skillet. Stirring occasionally, cook until veggies are tender, about 4 minutes. Add noodles to the skillet, stir, and cook just until any excess water has evaporated and noodles are hot, about 2 minutes. Add butter, remaining 1/8 tsp. salt, and sliced chicken to the skillet. Cook and stir until ingredients are well mixed and butter has melted, about 1 minute. Add Parm-style topping and mix well. If you like, season to taste with additional salt and pepper. What about you? What's your favorite lunch food? What are your go-to, quick, low-calorie lunch recipes? Everday for lunch I have the same thing- 2 egg whites with 2% cheese on wheat bread, 100 calorie popsmart, and a piece of fruit. grill up some chicken tenders, get some Mission Carb Balance tortillas, salsa, and fat free cheese! Then make tacos/burritos! you can put it all in the fridge too and just take it out as you need it. The Mission brand is really good if not a little expensive, but they make a flour tortilla to die for... that tastes just like a regular! except loaded with fiber! Whenever you talked about teaching, classes and your students, your passion and enthusiasm always shined through on your blog. Whoever gets you next will be getting a great teacher, and will be glad they hired you! Wow - I can't believe your job is over! It sounds like you were REALLY successful (yay! ), and hopefully you'll get started somewhere else soon! Meanwhile - that food looks DELISH!! Sorry for the loss of your job! I really hope something exciting opens up though! For lunch I am always satisfied with a tuna sandwich on whole wheat bread and string cheese. Also, it can be lower calorie if, instead of using mayo, I use rice vinegar to make it moist.